“Dad always told me: ‘When you put on a uniform, you hustle.’” So said Del Unser in 2011, looking back at his career and the lessons he learned from his father.1 Al Unser served the game for more than 40 years as a professional player (including four in the majors during World War II), manager, and scout. Del followed in his footsteps. Unser also talked about the importance of hustling in 1980, when he helped the Philadelphia Phillies win the World Series as a reserve. “He [Al Unser] told me once you put that uniform on, just forget everything else and go out and do it.”2 Del was a solid professional. At his best, he hit in the .280s/.290s, though some lean seasons brought him down to .258 lifetime. The lefty was a line-drive hitter with occasional power (.358 career slugging percentage). He didn’t draw a lot of walks or steal many bases either. But he was a good center fielder who became a useful utilityman and pinch-hitter late in his career. Though Unser was stuck on losing teams for the most part, he did enough things well to stay in the majors for 15 seasons. His Wins Above Replacement (WAR) mark was a respectable 16.6. After his playing career ended, Unser went on to become a batting coach, farm director, and scout for the Phillies. As of 2014, he had been involved with pro baseball for close to half a century. Delbert Bernard Unser was born on December 9, 1944, in Decatur, Illinois. This small Midwestern city is in the central part of the “Land of Lincoln,” about 45 miles east of Springfield, the state capital. It has produced several other major-leaguers over the years; the best-known are Bill Madlock (who moved there when he was two), Charlie Dressen, Boom-Boom Beck, Hobie Landrith, and Jeff Innis. Del was the third of eight children (four boys and four girls) born to Albert and Ruth (Marten) Unser. His brothers were Albert Joseph (A.J. ), Jerry, and Larry; his sisters were Janet, Colleen, Elaine, and Annette. Larry Unser played two seasons, 1972 and 1973, in Class A after the Cleveland Indians drafted him. Though A.J. also had baseball talent, he chose not to go into pro ball. He coached the freshman team at Mississippi State University, where Del went to college. As one would expect, Unser’s father was a prime early influence. “My Dad. . . put up a batting cage in our backyard for me and my brother, A.J., to take swings from a pitching machine. I hit the neighbor’s home a few times. I would hit to left, hit to right. Yes, the batting cage helped me reach the big leagues.”4 It also helped his friend Roe Skidmore, who got into one game with the Chicago Cubs in 1970. Unser attended St. Teresa High School in Decatur, which renamed its baseball field in his honor in 2002. On the diamond, he was then a pitcher and first baseman, but he was also an all-city basketball player. In addition, he played halfback and safety in football. Throughout his life, Unser has been an avid golfer. During summer vacations from high school, “I would play 36 holes at Nelson Park in the morning, then go to work at Walker’s Market.”6 Those shifts ran from 2 in the afternoon until 10 at night. After graduating from St. Teresa, Unser went to Mississippi State University on a baseball scholarship. He chose MSU because the coach, Paul Gregory, was an old friend of Al Unser’s.7 They had been batterymates with the Hollywood Stars of the Pacific Coast League in 1947. Del Unser’s career at MSU was so good that the Mississippi Sports Hall of Fame inducted him in 1997. At that time, Unser was still a pitcher; he also played first base for Lincoln and was a second-team CICL all-star.9 Ahead of the summer of 1964, he was drafted by the Springfield team in the CICL.10 He went instead, though, to another very strong summer loop – South Dakota’s Basin League. This league, which existed from 1953 to 1973, featured a mix of college men, some pros, and locals. Unser played for the Pierre Cowboys in both 1964 and 1965. His most notable teammate in 1965 was Ted Sizemore, who was then still a catcher. Also on the squad was Matt Galante, who went on to manage in the minors and coach in the majors for many years. Unser was drafted three times before he turned pro. The Minnesota Twins selected him in the second round in 1965, but he did not sign. He reportedly turned down a $32,500 offer from the Twins, but said he had no regrets. “I had a lot of things to think about,” said Del in 1966. “I was worried about school, the military service, and that senior year, which meant an awful lot to me.”11 Indeed, he was named a President’s List scholar that year. Del had also gotten married on December 18, 1965 to Dale Donnelly. They were already expecting their first child when he signed with Washington.14 The Unsers had two daughters named Corinne and Angela. Unser earned a trial with the big club in 1968 on the strength of his performance in the Florida Instructional League in the fall of 1967 – he led all batters with a .347 average.16 Also, center field was an unsettled position for Washington then. During the 1967 season, three players – Fred Valentine, Ed Stroud, and Hank Allen – split the playing time almost evenly. General manager George Selkirk mulled a trade during the off-season but took no action. Ed Stroud became the Senators’ primary center fielder in 1970. After Unser got hurt in April, “The Creeper” impressed Ted Williams, who said, “He [Stroud] is gonna have to prove he can’t do it. Del wants to play, and I may put them both in the lineup, but I’m not taking Stroud out, not yet.”22 As it developed, Williams used Unser in right field a good deal, as well as center, and in left field on occasion. In 119 games, Unser hit .258-5-30. Unser had another respectable year with the Phillies in 1974 (.264-11-61 in 142 games), but that December he was traded to the New York Mets in the six-player deal that brought Tug McGraw to Philadelphia. 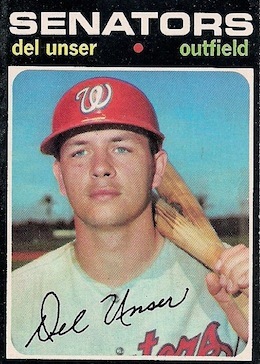 Unser was an upgrade over Don Hahn, the center fielder who went to Philadelphia along with McGraw and Dave Schneck. Although reliever Mac Scarce was damaged goods when he came to the Mets, John Stearns was a promising catcher who had several good years in New York. Without question, though, McGraw alone meant that Philadelphia got the better of the trade. With the Mets in 1975, Unser got off to another hot start – he was in contention for a starting spot in the All-Star Game that July before Jimmy Wynn, Reggie Smith, and Greg Luzinski passed him in the last week of fan balloting. A rib cage injury bothered him in the second half, but he still finished at .294-10-53 in 147 games. Unser started well again in 1976. On April 19 and 20, he had two especially memorable games in St. Louis against his old favorites, the Cardinals. The Monday night game on the 19th was nationally televised on ABC – and it ran 17 innings, not ending until 1:46 A.M. Unser misjudged a ball in the first inning that helped the Cardinals score two of their runs. He said, “Any time I make a mistake defensively, I take a lot of remorse in it. I couldn’t find a place to hide after that happened.”28 He also went hitless in his first seven at-bats. The following evening, Unser hit another homer in his first at-bat. The next time he came to the plate, pitcher Lynn McGlothen drilled him in the elbow. A war of retaliation then ensued. Sure enough, McGlothen led off the bottom of the third inning, and Mets starter Jon Matlack gave him some chin music. Strange to relate, then Matlack led off the top of the fourth, and McGlothen threw two pitches inside before hitting Matlack with the third. Both benches cleared. On July 21, the Mets dealt Unser and third baseman Wayne Garrett to the Montreal Expos for Jim Dwyer and Pepe Mangual. The trade was not a good one for the Mets. Mangual was young (24) and fast, but he did not hit for the Mets and was out of the majors after 1977. He is best remembered for Jack Lang’s barb, “Pepe Mangual can drop anything he can get his hands on.” Dwyer eventually went on to a long and productive career as a role player, but he played just 11 games for the Mets. In his first game against the Mets after the trade (his third with Montreal), Unser hit a game-ending homer in the 11th inning at Jarry Park to give the Expos a 3-2 win. He hit seven altogether for Montreal in 1976, which gave him a single-season career-high of 12 (although he hit just .228 overall in 146 games). In 1977, the Expos unveiled a very talented young starting outfield. Warren Cromartie (age 23) was in left. Rookie of the Year and future Hall of Famer André Dawson (age 22) was in center. Ellis Valentine (also 22) moved from center to right. Even so, Unser got into 113 games, backing up the young trio as well as veteran first baseman Tony Pérez. He tied his career high with 12 homers and hit .273. That year also marked Unser’s only postseason play, and he made it count. He was 2-for-5 in five games in the National League Championship Series against Houston. In Game Five, his two-out pinch-single in the eighth inning brought home the tying run. He stayed in to play right field and scored the winning run of the Series after doubling in the 10th inning. During the World Series against the Kansas City Royals, Unser was 3-for-6 in three games. In Game Five, against ace reliever Dan Quisenberry, Unser doubled in the tying run in the ninth inning and proceeded to score the go-ahead run, which stood up as the margin of victory. After the season, Unser re-signed with the Phillies as a free agent. During the strike season of 1981, he got into 62 games but started just four of them, two in left field and two in center. He also spelled Rose at first base during 18 games. He started well with the bat, despite his sporadic appearances – but went just 2-for-40 from May 26 onward. As a result, he finished at .153-0-6. “You can expect to be playing somewhere else next season,” Phillies president Bill Giles told Unser, who appreciated the honesty. Paul Owens added, “We’ve got to make room for the younger kids.”40 Yet when the 1982 season started, Unser was still on the roster. He played a few innings here and there at first base and in right field. He was hitless in 14 at-bats with three walks in 19 games, and the Phillies released him on June 8. His big-league career had ended. That October, Unser replaced Deron Johnson as first-base and batting coach at the major-league level. When he was hired, he said, “If you see something flagrant you have to say something or you’re not being fair to yourself or the player.” His goal was to find out what each individual responded to.42 Unser served in the dual role through 1987, then focused solely on batting in 1988. However, manager Lee Elia dismissed him that July. The high point of Unser’s time as farm director was 1993, when Philadelphia won the NL pennant. That squad did not feature a great deal of homegrown talent – Lee Thomas made numerous shrewd trades and signings – but at least one frontline contributor was drafted and developed on Unser’s watch, shortstop Kevin Stocker. Probably the best players the Phillies drafted during his tenure were Scott Rolen and Pat Burrell. Wade offered Unser a position as scout. Del thrived on the travel and report-writing, as well as many special assignments, and worked closely with Wade’s successor, Pat Gillick.47 The pace didn’t slow down under Ruben Amaro Jr., who succeeded Gillick, though Del continued to enjoy golfing in the off-season. He and Dale moved to Scottsdale, Arizona in 2001. Grateful acknowledgment to Del Unser for his input (handwritten responses on a draft of this biography, received April 9, 2014). Bob Gordon, Game of My Life, New York: Sports Publishing, 2008. 1 Bob Fallstrom, “Del Unser isn’t content to sit on the sidelines,” Decatur Herald-Review, April 18, 2011. 2 Milton Richman, “Now everybody wants Del Unser,” United Press International. October 16, 1980. 5 Scott Taylor and Dr. Kris Row, Home Run: The History of the Goldeyes and CanWest Global Park, Winnipeg, Manitoba: Studio Publications, Inc., 2005, 33. 7 Bob Addie, “Nats Sweeten Pot to Grab Unser, Picket Who Spurned Twins’ Bid,” The Sporting News, July 16, 1966, 38. 8 Ed Alsene, “Sons Bring Big-Time Look to College Loop,” The Sporting News, June 29, 1963, 33. 9 Ed Alsene, “Unanimous Four Top CIC Loop’s All-Stars,” The Sporting News, August 31, 1963, 37. 10 Ed Alsene, “Summer League Coaches Select 79 Collegians,” The Sporting News, May 23, 1964, 42. 12 Abe Chanin, “Arizona Schools Boast 3 All-America Picks,” The Sporting News, July 23, 1966, 23. 15 Bob Addie, “Selkirk Vetoes Bids; Senators Unlikely to Deal,” The Sporting News, December 23, 1967, 35. 17 Merrell Whittlesey, “Freshman Senator from Illinois Sets Tongues Wagging,” The Sporting News, May 4, 1968, 8. 19 Merrell Whittlesey, “Everything Adds Up to Busy Winter for Math Major Unser,” The Sporting News, October 5, 1968, 42. 23 Merle Heryford, “Rangers Size Up Foster as Home-Run Threat,” The Sporting News, December 18, 1971, 47. 24 “Will Del Unser at 29 Prove He Is Among Great Ballplayers?” Associated Press, March 25, 1974. 25 “Del Unser, Leroy Kelly Win Event,” Associated Press, February 5, 1973. There were several other great athletes from the National Football League at this celebrity tournament, but from baseball alone, this list also included Joe DiMaggio, Jim Palmer, Juan Marichal, Reggie Jackson, Willie Mays, Johnny Bench, Billy Williams, Joe Morgan, Thurman Munson, Ray Fosse, Ron Santo, Sal Bando, Jimmy Wynn, Willie Davis, Ted Sizemore, Bud Harrelson, Jim Lonborg, and Dave McNally. 26 “Del Unser Kills the Ho Hums; From Ohio to Philly with Love,” Associated Press, July 18, 1973. 28 Will Grimsley, “Mets 4, Cards 3,” Associated Press, April 21, 1976. 29 Letter from Del Unser to Rory Costello, received April 9, 2014. 30 “Mets’ Unser Out of Lineup,” United Press International, April 22, 1976. 31 Jack Lang, “Surprise! Mets Have New Hot Sacker, [Joe] Torre,” The Sporting News, June 5, 1976, 15. 32 “All of a Sudden, Del Unser Loves Playing Baseball with the Expos,” wire service reports, July 24, 1976. 33 Ian MacDonald, “Expos Bolster Weak Spot: the Bench,” The Sporting News, December 30, 1978, 38. 35 Ron Rapoport, “For Del Unser, it was the revenge of the pinch-hitter,” Chicago Sun-Times, October 16, 1980. 36 Lee Lacy hit pinch homers in three consecutive at-bats in May 1978 – but they were not consecutive plate appearances. He also drew a walk as a pinch-hitter during that period. 37 “Phillies 6, Padres 5,” Associated Press, July 11, 1979. 40 Vin Mannix, “Unser’s hour drawing near,” Boca Raton News, March 28, 1982, 1D. 41 Bob Gordon, Game of My Life, New York: Sports Publishing, 2008. 42 Peter Pascarelli, “Bat Coach Unser Plans to Speak Up,” The Sporting News, October 29, 1984, 40. 43 “Elia dismisses Unser, [Dave] Bristol,” Associated Press, July 15, 1988. 44 Paul Hagen, “Unser Named To Head Phils’ Minor Leagues,” Philadelphia daily News, September 6, 1989. 45 Jim Salisbury, “Phillies Shuffle Farm Lineup, Naming [Dallas] Green,” Philadelphia Inquirer, August 18, 1998. 46 Tony Zonca, “‘Minor’ shakeup for Phils,” Reading Eagle, August 18, 1998, D1-D2. 47 Fallstrom, “Del Unser isn’t content to sit on the sidelines”. Gordon, Game of My Life.